Hello everyone! How are your weeks going? Anyone have exciting plans for the weekend? This weekend I have yoga teacher training, and I’m excited to see what’s on the curriculum! In a weird way, it seems that whatever sort of life lesson I need for that week is somehow encapsulated into my yoga teacher training. For example, last week I was feeling a little nervous about going to the training session because my stomach was feeling funny. But during our class (we were going over the solar plexus chakra), another trainee spoke up and told us about her issues with digestion / anxiety. It turned out she had been going through nearly identical issues as I had been! We ended up getting lunch together and talking about our lives. And let me tell you, this girl is hella cool – she does spoken word poetry, and dreams of opening a yoga studio in the city where young black girls can find refuge and learn about their self-worth. Rock on lady! She went on to tell me about her experience as a black girl with mental health issues, saying that she didn’t have a lot of resources or places to turn for healing. Hearing that made me feel sad and little angry that the state of mental health awareness in our country is so lacking. But this awesome girl saw a problem in her community, and has a dream to make a difference. Hearing her talk about her goals really inspired me to think about mine. I love yoga, and I love learning the difficult poses and stretching (no pun intended) my practice to the limits. 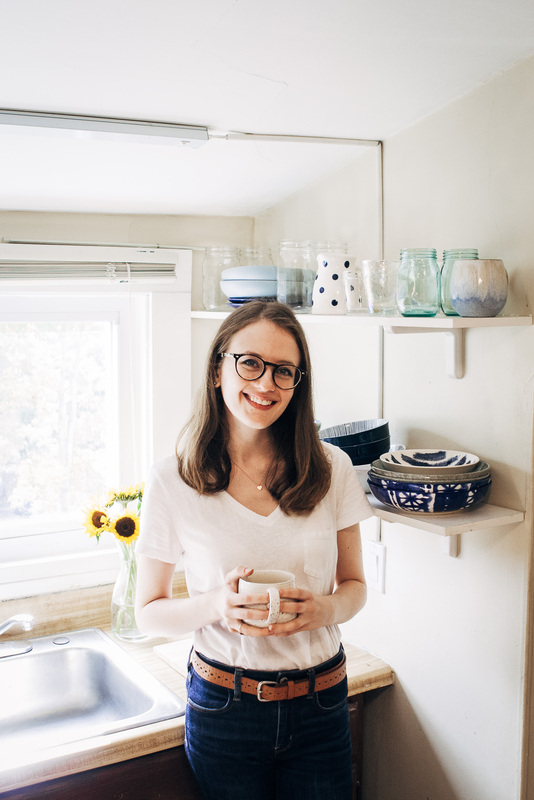 But in terms of teaching, I want to teach in some sort of community setting – specifically, teaching yoga to people with disabilities or injuries, maybe in a hospital or nursing home. I would also love to teach a community yoga class for people with ASD (Autism Spectrum Disorders). This is a cause very close to my heart, as my sister has an ASD, and I have seen first hand the kind of adversity she has faced because of it. I want to create a safe space for people with ASD, and let them know that they have every right to come to a yoga class. Yoga is for everybody. There are definitely stereotypes about the right yoga “bodies”, but to be honest they are all bull$h*t. YOGA IS FOR EVERY BODY. Don’t listen to anyone else who says otherwise. 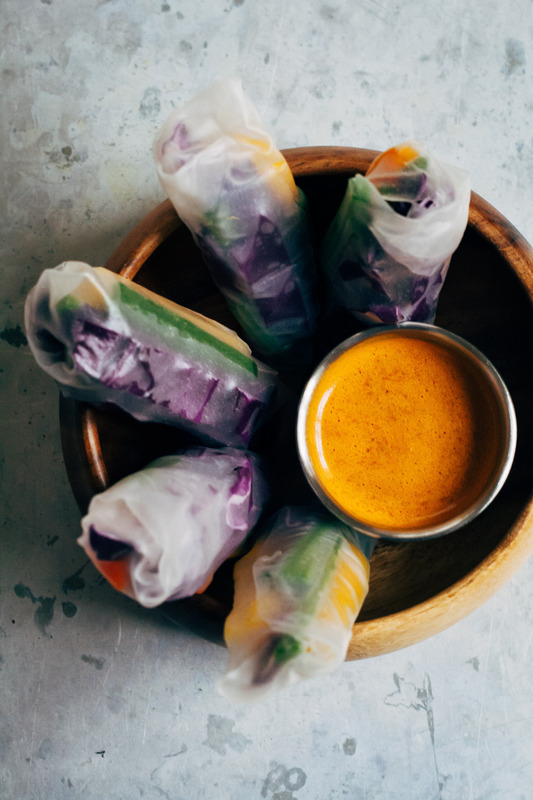 These healthy, raw spring rolls are delicious paired with a mouthwatering, spicy sesame sauce. Perfect for a light dinner or lunch on the go! 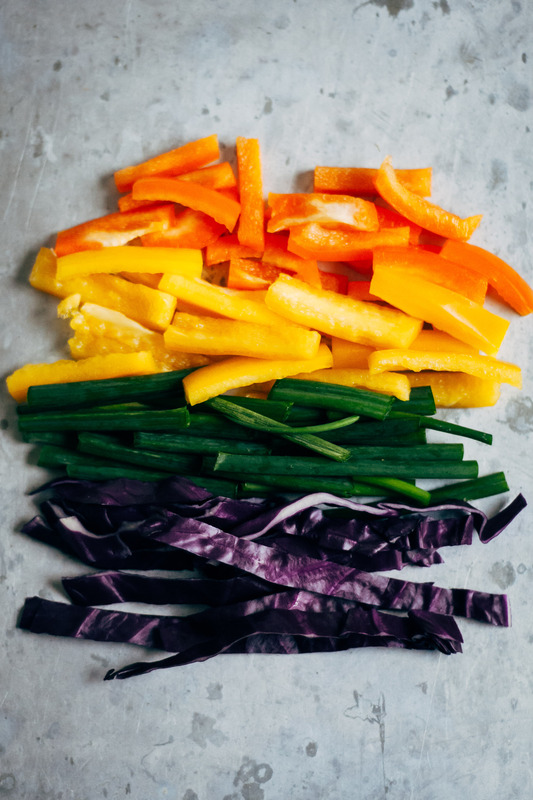 Prep veggies by cutting them into thin strips, about 1/4 inch wide and 3-4 inches long. With scallions, use only the green parts for the spring rolls. Save the white bottoms for the sauce. Fill a large bowl with warm water. To prep rice paper rolls, soak in the warm water for about 20 seconds. Then, take out of water and start filling with vegetables. 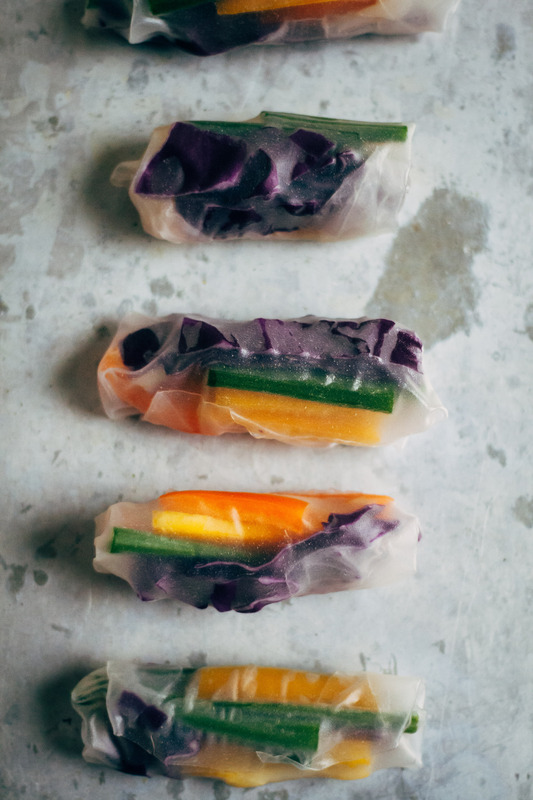 Roll the rice paper rolls as you would a burrito. No worries if any of the rice paper rolls break - just start over with a new one. They can take a while to get used to! 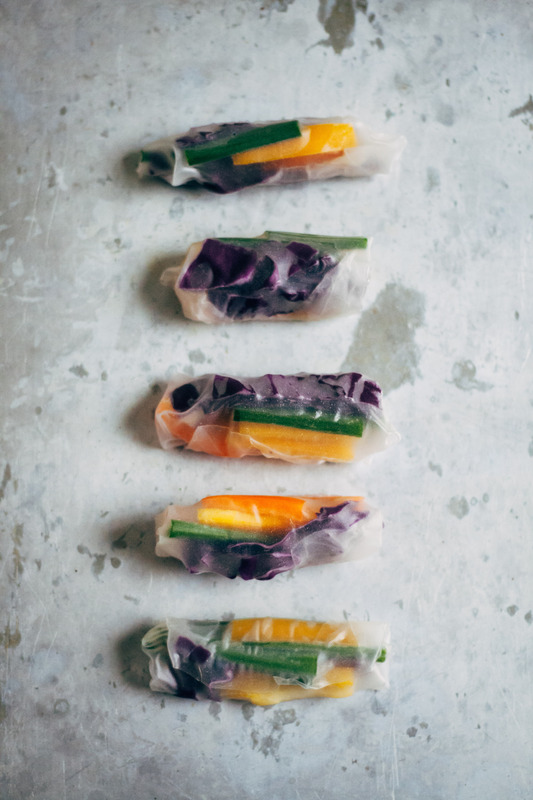 Continue rolling spring rolls until out of veggies. To make the sauce, combine all ingredients in a blender and blend until smooth. 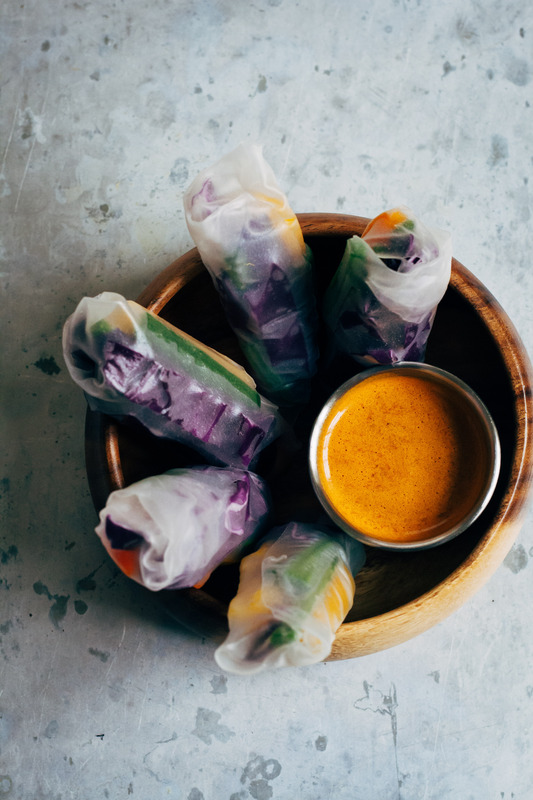 Serve spring rolls with sauce. Enjoy! How to have a yoga body: Have a body, do yoga. These are beautiful! I love that sesame sauce! Hmm! We often make summer rolls but next time I think we will have to try them with this sesame sauce! These look delicious! I LOVE spring rolls. And that sauce? Loved having a peek into your life through this story and hats of to your new friend and her mission to help young girls. 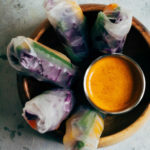 And also, I love spring rolls and these sauce looks awesome, need to try, Thanks for inspiring. I am making these! 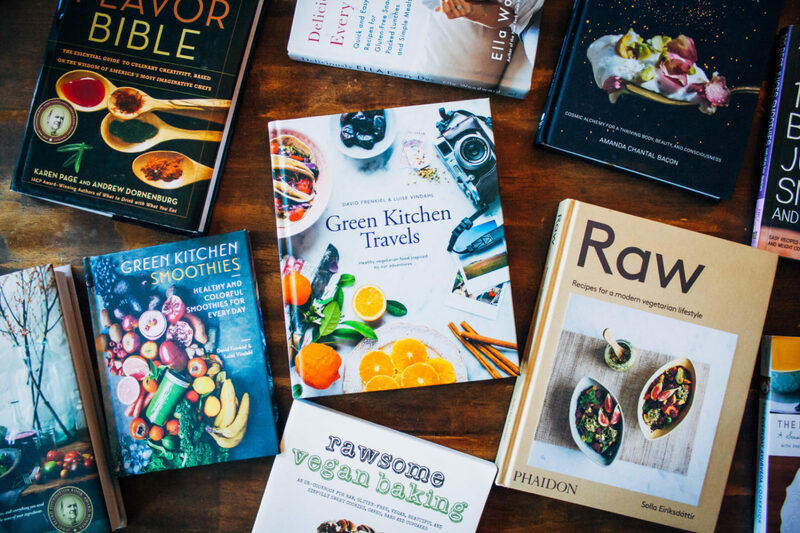 All next week I am eating raw. Just need to take a mini break from all the carbs and I think this will be the perfect lunch plus I am keen to try the sauce.